What is content writing? The term is everywhere. I was surprised at the confusion out there. Ask ten people “What is content writing?” and you’ll get ten answers. One article offered 40 definitions of content writing gathered from an online survey. That’s just a little too complicated for most of us. As you know, one of my goals is to make content writing simple. Forty definitions ain’t going to do that. To get to the nitty-gritty and understand content writing, let’s drill down a bit. Content is relevant, valuable information. It is valuable to those readers in that it is helpful, appropriate, practical, entertaining, or useful. 2. What Medium Is Appropriate for Content? The distinguishing factor is that the information is relevant and valuable, no matter what medium is used to present it. 3. What’s Unique about Online Content? In the past if you needed information you started your search at the library. Since then, the internet has thrust the term “content” into the spotlight. Today, online content is the first gateway to acquiring information. Contrary to what you may see on social media, blogs, and websites, good online content is not simply a bit of text tossed onto the web. Instead, the good stuff is carefully structured for the web (see these tips for online writing). And good online content contains keywords. These are terms or phrases associated with a particular topic, designed to pull in readers who search for those terms online through search engines. Online content that contains most-searched-for keywords has a better chance at higher rankings on search engine results – also called “search engine optimization” or SEO. A writer who understands how to find keywords and use them strategically in online writing is called an SEO content writer. And yes – if you write good online content, you’ll get noticed. 4. What is Content Marketing? Content marketing is a promotion strategy. It presents relevant, valuable information for the purpose of attracting readers and moving them to act. Here’s how it works: when your content provides good information, you build an audience of followers . As you continually and consistently offer reliable, quality information that they need over time, you build trust with these followers. They recognize your credibility. Ultimately, your content equips your readers to engage, to participate, to purchase, to give, to support, to volunteer, to become an advocate, or otherwise take action. Content marketing is a long game. 5. What Is Content Writing? Content writing is relevant, valuable information delivered in words (versus images, video, or audio). Content writing’s main distinguishing factor from content in general is that it communicates in prose. 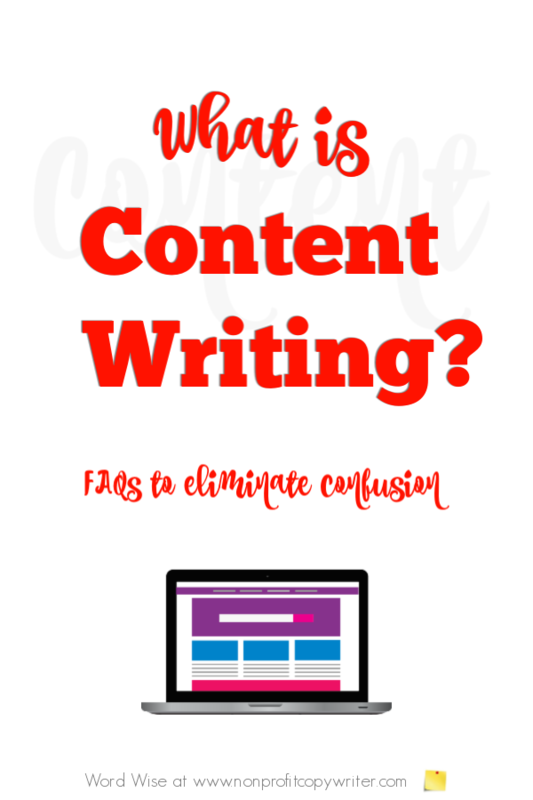 Written content can include websites, blog posts, emails, auto responders, social media posts, white papers, e-books, downloads, PowerPoint presentations … pretty much any kind of valuable information that’s presented by text. Often, written content includes an image (as do most of my posts). But its key vehicle for communication is words. Content writing is not limited to one writing style. You can produce valuable, relevant content that follows the textbook AP format as well as valuable, relevant content in folksy, personal blog posts or pithy social media content posts. Even copywriting – text that persuades – is simply one form of written content. As long as the content delivers helpful or useful or entertaining information in words, it qualifies. 6. What’s the Key to Using Content Writing Successfully? There’s plenty of irrelevant, ineffective content out there. … but delivered with quality. That’s the kicker. Give your readers what you’d like to get: valuable, relevant, quality content writing. How? By reading what you write. How do you use content writing to help your readers? Share your comments below!